Then this past October (the weekend after my wedding, my husband is very understanding) we costumed up and went back for the third and final "chapter" of this series of one-shot games. This time the the group I attended with was a bit larger. After the events in Hungary, Professor Veritas left her faith and work with the Vatican behind. 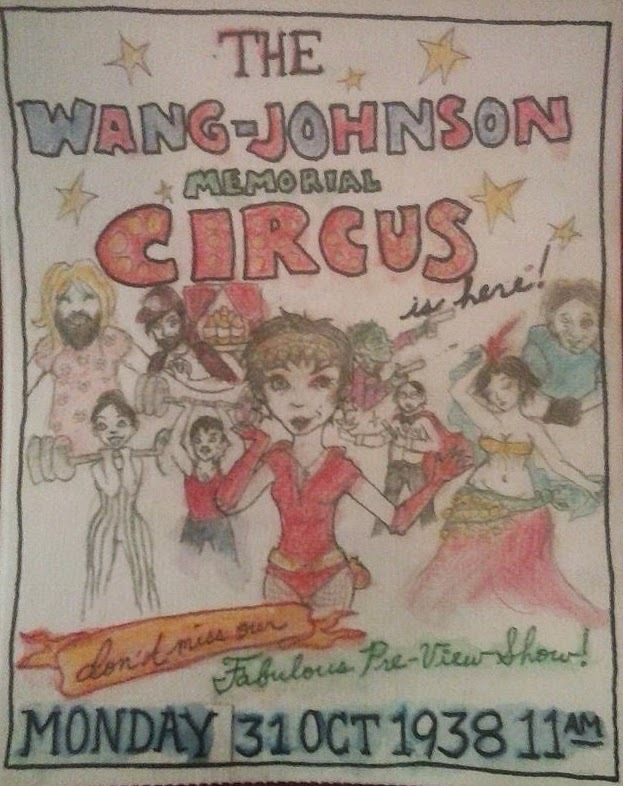 In memory of the circus proprietors Messieurs Wang and Johnson who fought by her side for survival, she founded the Wang-Johnson Memorial Circus. Drifting along in the wake of Hungary as well, Shaw LaMont joined the growing circus. Now, near the end of October, 1938, we come to West Windsor Township, NJ, seeking to profit from the traveling crowds attending the World's Fair and looking into a generous offer by a local family for winter lodging in addition to a performance venue. Little did we know what madness was in store, and what forces aligned to bring Shaw and Professor Veritas back with so many survivors of the events in Hungary? There was an air of excitement, the German good will tour happened by, and we were all eagerly awaiting a broadcast by Orson Welles (what turned out to be the hysteria raising War of the Worlds radio drama). Excitement soon turned to anxiety, with Welles' broadcast cutting out, townsfolk running in panicked with news of a found alien corpse and then something that can only be described as an alien visitation or as a mass hallucination. No one was quite sure of what they saw, or heard. Something possibly insectiod or robotic. Was it asking for help or offering help, and if something this monstrous was offering help, what was lurking in the shadows? We deliberately scheduled the "real" show to take place after we'd all be dead or have escaped. Since we came as a circus, we arranged a mini-show for players and cast for late Saturday morning. Early enough on that we knew we'd all still be mostly healthy, sane, and actually interested in a show. Surprisingly, we weren't attacked during the performances. Our ensemble included a magician, a fortune teller/belly dancer, a strongman and strongwoman (both named Sasha), a lizard-woman sharpshooter, a bearded lady, and others. One of the advantages of coming with such a large organized sub-group players is that we had the ability to cover the full range of skills and abilities. As the circus "gypsy" fortune teller, my role was that of helping others through mental trauma and unease. 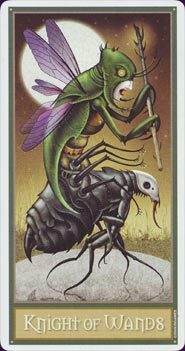 In preparation for the game I located a gorgeous and somewhat disturbing tarot deck, and learned to read tarot. The folks running the game loved the idea of using tarot for the psychology skill. I swear I didn't realize that my tarot deck had a card that resembled a Mi-Go when I bought it. What I could not have expected was how well using tarot would work within this game. I chose to use a seven-card spread indicating two possible paths/directions/decisions (one card representing the querant, one for the two possible paths, and two cards accompanying each path). Often the readings worked reasonably well with the characters, and players and I had a great time with the readings. But then I'd do a spread that so perfectly matched the game and the options that it would blow us away. There were one or two where the spreads freaked out the other players near by and I had to convince them that I really have no ability or skill in stacking a deck. The cards were just that fitting. Starting late in the evening on Saturday and through Sunday morning I spent a lot of time with the two gentlemen who had survived both previous games (the only two characters that made it through both games) keeping their sanity in check. Both new things that none of the others did, and one turned out to be a crucial piece in the final plot. Over the course of the game we discovered that there was an alien race replacing townfolk with sawdust men that keep returning no matter how many times they are slain. It seemed some of the Germans were working with locals in summoning occult forces, while others were there unknowing of their countrymen's machinations. We encountered hordes of Mi-Go, ravening ghouls, survived a mind-destroying encounter with a Shoggoth, and found one of our number possessed by a Yith, helping us for its own reasons against the Mi-Go. Our numbers slowly decreased under the onslaught, with sanity decreasing despite our best efforts. Piece by piece we put together the larger picture. Then a man long thought years dead arrived with the final pieces. Access to a portal through which we could attack the Mi-Go forces on Pluto, and gather the remaining pieces needed to take on the cultists summoning Nyarlathotep. Near 4:30AM, when the stars aligned, we took on the cultists seeking to summon Nyarlathotep. With little sleep, in the dark, and with preciously few resources of any sort. Somehow we survived, taking down the cultists and ghouls, but not soon enough to stop the summoning of Nyarlathotep. One of our party signed his soul to Azathoth in order that the rest of live, while Nyarlathotep tempted others to sign with rewards and promises or resurrection for our fallen friends. So we gathered ourselves together, leaving the carnage behind, and made to the German's zepplin, our promised escape. We made it off the ground, but found that we were not safe. Over the next hour or longer we fought sabotage and wave after wave of flying Mi-Go. This part of the game was absolutely brutal. We were so close to the end, we saw the outside turn from dark to light. The floor of the space was a cold concrete leeching the warmth out of our bodies. And the waves kept coming from all sides. Between waves we'd shore up our wounds, mental and physical, and wait for the next wave. Multiple times characters went temporarily insane, enough that one more instance of sanity loss would have driven some completely and permanently insane. I was flat out miserable. Cold, tired, hungry, and shaky. It came down to sheer stubbornness that I didn't just give up. When we finally landed we didn't know if this was the end. Would we finally be able to escape? A few of us came out of the zepplin, to be greeted by a man thanking one of our number for his courage, valor, and service to his country, right before our greeter was assassinated by the sawdust man Sheriff from the town we had fled. We killed the Sheriff but were unable to save the agent. As the rest of us came out, blinking in the early morning sunlight, the Yith bade us farwell. Thanking us for our assistance in derailing the plans of the other race, that would have ultimately vastly delayed the extinction of the human race and the rise of the next dominant species. At which point game was called. Suddenly the misery of the last hours was replaced with elation. We did it. So many of us survived it was incredible. Personally, after being up for at least 22 hours, I went to pass out for a nap before breakfast. What's really amazing is how much you bond with the people you go through something like this with. That we actually had fun while in such miserable and desperate situations. 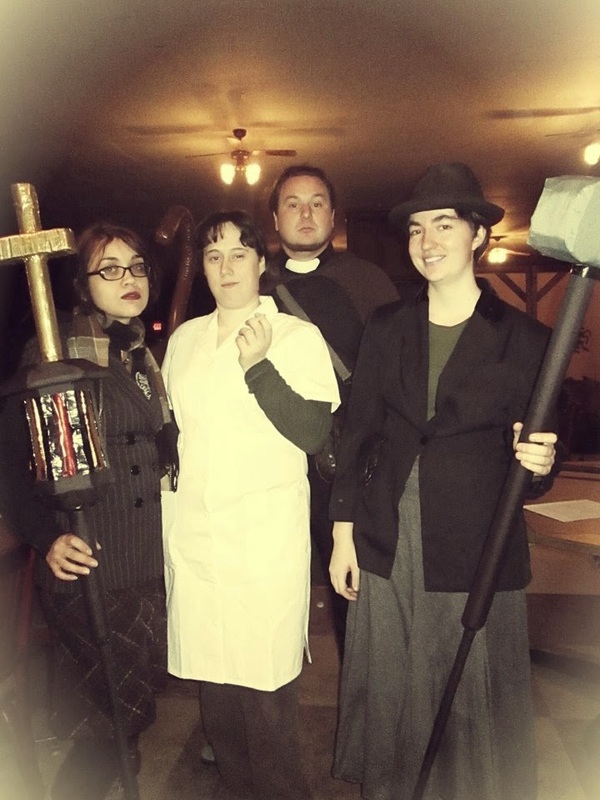 The group that put on this LARP has an incredible bar set in terms of production quality, and while nothing is perfect, they have become the basis that I compare other LARPs I attend to. Personally, I'm sad that this was the final chapter of this story arc, but I have hope that the minds behind this game will run other story arcs or one shots that I may be able to attend. The next LARP I'm making is a Zombie Survival setting, and I'm attending with at least two of the folks from the Circus group, and the player of "Mr. Wang" from the previous chapter. I may also NPC a second event during that time, and will be starting to act as a (hopefully) regular NPC in a long-running game that two of my friends take part in.